Members of the Jewish and church communities have begun fundraising for the multi-year process to renovate the historic Temple Beth El building on Woodward Avenue in Detroit. 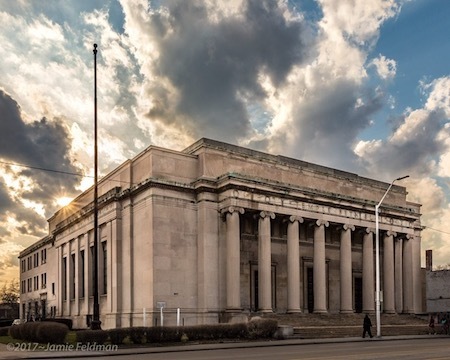 Created in 1922 by architect Albert Kahn, the idea is to restore the 55,000-square-foot building as a community center, interfaith worship, and performing arts space. Hinds adds that the restoration will take place in stages, so that the religious and community groups that currently use the space won’t be displaced. The first part of the restoration will be focused on the main sanctuary for worship and performance art, followed by maintenance to the building’s elevators and facilities. Next will be improvements to the gym and social spaces, and finally renovations to the four levels of smaller auditorium space, classrooms, and offices, were many community groups such as the Castle Group and the Pheonix Center currently operate. Hinds is also collaborating with Rabbi Ariana Silverman, who is on the Bethel Community Transformation Center’s board of directors, noting that the goal of the renovation is to strengthen the interfaith community and give people a place to come together. There are also plans for the Jewish Historical Society to have an exhibit in the new building, to provide additional educational opportunity regarding Detroit and its history. “We’ve heard of congregations renting space from another faith community, but we’re intentionally creating space for the purpose of worshiping together in this space,” adds Hinds. Hinds also says after securing funding for initial repairs, the project will search for an architect that specializes in historical preservation, because they want to retain as many original designs as possible. A Kickstarter campaign has been launched to raise $100,000 to repair roof damage and get the project started. More information about fundraising for the project can be found here.